When I was nine, we moved to a bigger house a few streets away from the one I’d grown up in. There were grand plans to build a beautiful kitchen/dining room extension (which is now in place, and the absolute heart of the household), but when we first arrived we had to make do with a teeny tiny kitchen that was actually smaller than our old one. Part and parcel of the new kitchen was new equipment, including an electric oven and hobs which my Mum absolutely hated – she’d always cooked on gas (quite literally, she’s a brilliant cook) – and a microwave, which was less of a hated object than an absolute unknown. Having never wanted, or felt the need, to own one for the previous forty three years, on arriving at the new house, my Mum decided a little microwave experimentation was in order. In the first week or so after moving in, she subjected my brother (being a fussy nine year old I’d opted out of this experiment, and I’m not sure what my Dad was doing, but I distinctly remember my brother being the only victim) to a weird and wonderful array of microwaved meals: eggs, bacon, some sort of risotto and I’m sure I remember even a piece of chicken ending its days being zapped by radio waves. I might have made the last one up, but what I do remember is that after about forty eight hours my Mum relented and admitted that microwave cooking just wasn’t for her. To this day, our little microwave oven has only ever been used for heating milk and melting chocolate (two important tasks in any household, but small ones nonetheless). Whenever a new ingredient arrives in my kitchen, I have a tendency to get caught up in the excitement of experimentation and cooking it every which way, just as my Mum did with that microwave. A couple of years ago it was brussels sprouts. After Carnivorous Boyfriend admitted one night he liked them, I served these little brassicas more than once a week for several weeks, boiled or steamed, shredded or roasted, fried with bacon and sage or chopped through with chilli and ginger, stopping only when he explained that although he had enjoyed sprouts, he’d be happy never to see them again after I’d cooked my way through every possible incarnation. With sweet stuff, the obsessive tendencies can manifest themselves even more strongly. In summer, find the most incredible fresh fruit and I’ll want to serve it with everything I eat for weeks and weeks. Discovering the joys of roasting nuts resulted in numerous desserts with these toasty little nuggets of goodness chopped over the top, stirred through or infused into whatever I was making, and don’t even get me started on what happens if I open a jar of Nutella. It will therefore come as no surprise that when I received a jar of Speculoos spread, slathering it on bread and stirring it into these soufflés was never going to be enough. 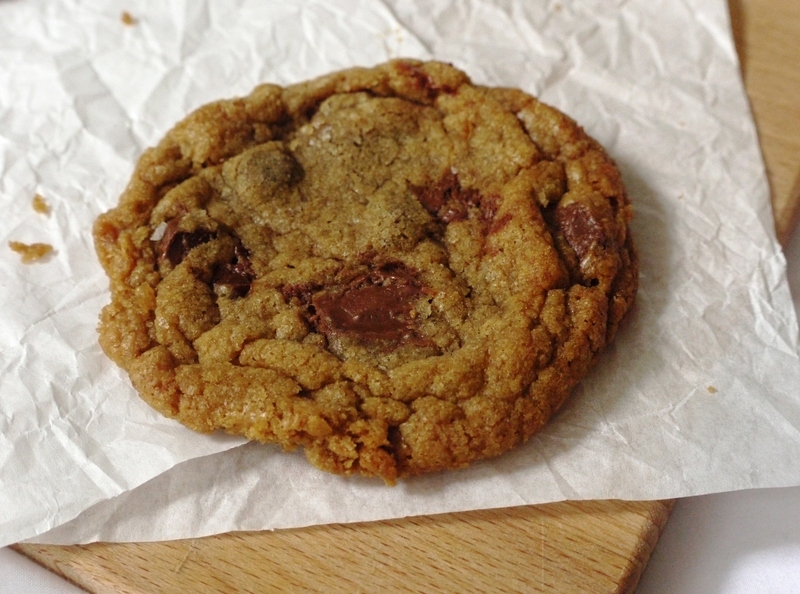 How many chocolate chip cookie recipes is enough for one blog? You could argue that with walnut and raisin, brown butter and buckwheat, marbled white and dark and a quest for the ultimate chocolate chip cookie under my belt, I’ve reached my quota. You’d be wrong. Like brownies, the perfect chocolate chip (or chunk, I’m a big fan of chocolate chunks in cookies) recipe is an elusive thing: one that can constantly be tweaked and refined over time. 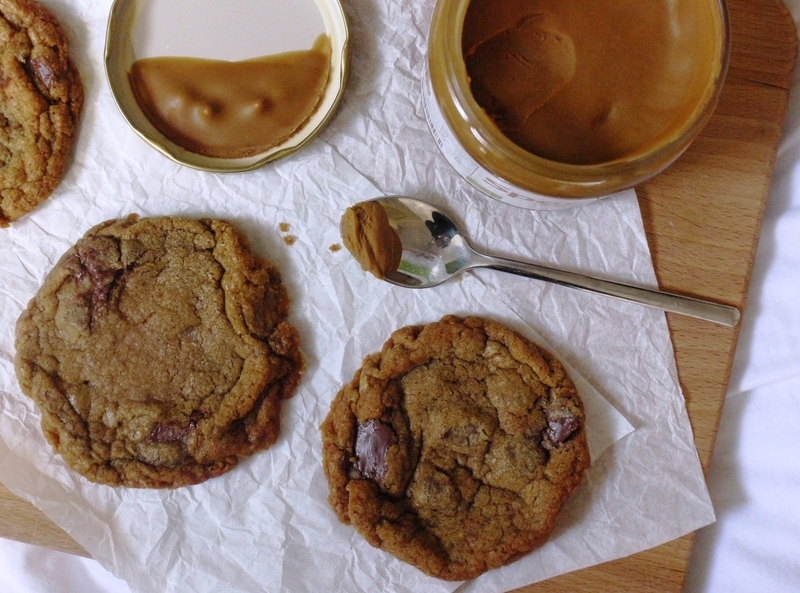 It can also be reinterpreted with various flavour combinations, hence the existence of these Speculoos spread cookies, and that can only be a very good thing. 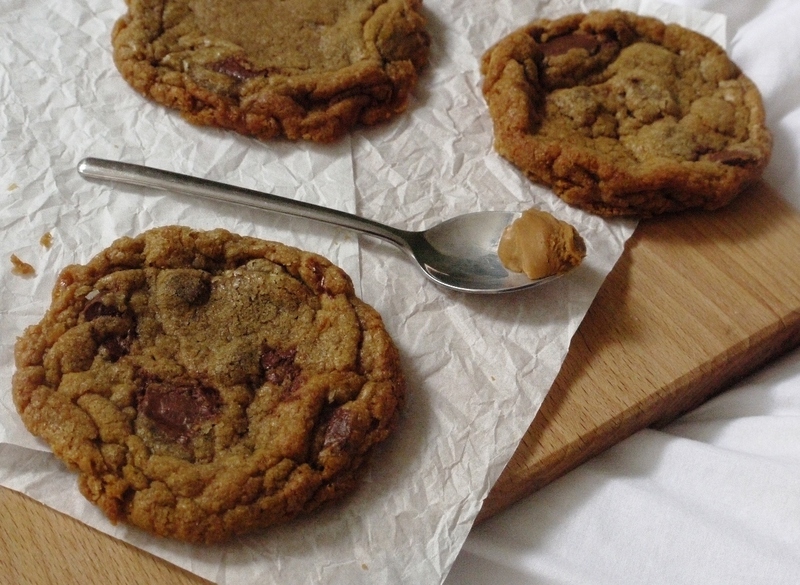 An adaptation of this peanut butter cookie recipe (via The Moveable Feasts – thanks Amy! ), adding more Speculoos spread and reducing the butter content to compensate, these milk chocolate chunk cookies are an absolute indulgence. The buttery, biscuity nature of the spread makes them just the tiniest bit greasy, but in a positive ‘licking sweet greasy butter from your chin’ way rather than anything more greasily grotesque. The milk chocolate chunks provide just the right foil for the spiced biscuit undertones of cinnamon, nutmeg and ginger, and the tiniest sprinkling of salt on top (a top tip for any cookie recipe) releases flavour making them taste sweeter, spicier and even more delicious than you could ever imagine. So there you have it, Speculoos spread cookies: my second experiment with Speculoos and possibly my last as I’ve somehow already reached the bottom of the jar. Although I did discover you can buy the stuff at Le Pain Quotidien in the UK, and there’s a Speculoos ice cream recipe I’m just itching to try . . . Watch this space. Sieve together the flours, whisk briefly then set aside. Beat together the butter and sugars until light and fluffy. Incorporate the egg a little at a time, then beat in the Speculoos spread and vanilla extract until combined. Carefully stir in the flours and chocolate chunks. Line a tray with baking parchment. Roll tablespoon sized pieces of cookie dough into balls and place on the tray about 6cm apart. Freeze for one hour. Preheat the oven to 175 degrees C. Line two trays with baking paper. Remove the cookie dough balls from the freezer, sprinkle the tops with a little sea salt (if using) and bake for 10 – 15 minutes, depending whether you like your cookies super soft or quite crispy. The Speculoos spread in these cookies makes the dough spread quite easily, so if you like your cookies fairly thick, take them out the oven after five minutes and reshape into a circle. If you don’t do this, they will spread extra thin and become crispier at the edges. Totally up to you, both versions are delicious. Perfect cookies! They look to have just the right balance between crisp and chewy. These cookies look great, and I can definitely relate to the food obsessions – my current one is dark chocolate and pecan nuts! Also, I love your blog and your great stories and recipes! Totally scrumptious looking cookies!!! I’ve never heard of Speculoos but will be checking Le Pain Quotidien as soon as I get back to London!! I agree with your Mom, people always look at me funny when they come into my kitchen because I don’t have a microwave, but I just haven’t ever found a meal improved by one! I love your photos! 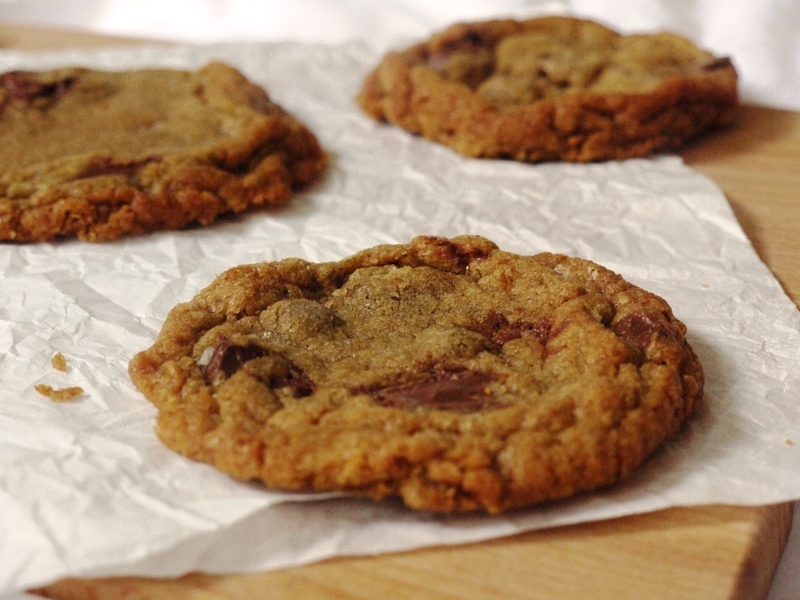 There can never be enough chocolate chip cookie recipes just as we never grow old enough to stop enjoying them. Thanks for sharing this scrummy recipe and for sharing your story too. I have never really liked microwave ovens for cooking as well. You can never have too many chocolate chip cookies or brownies on your blog! These cookies look delicious! I really must get my hands on some speculoos. 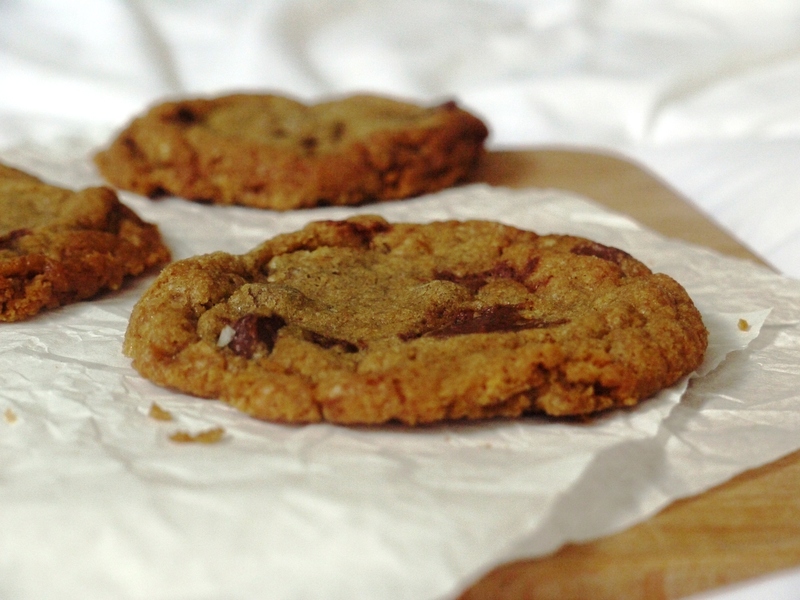 Amy – I’d love to try the cookies in their original form too, the ones on your blog look delicious! Cake Boule – Speculoos are a type of Belgian spiced biscuit, and the spread is made from ground up biscuits! Jenny – aw, thank you. And I’m the same with microwaves, I only ever use ours to melt chocolate! Daisy – I’m not sure Nutella would have quite the right consistency – I’d try using peanut butter instead if you can’t get hold of Speculoos spread. 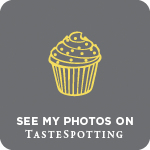 Baking Addict – do try to get your hands on some, it’s so good. Haha. When I lived in Brussels all my friends were obsessed with the Lotus brand Speculoos spread and I always had to bring back several jars to the UK. Two ideas for your next jar that were always sell-outs at our annual Christmas parties: Spekuloos cupcakes with a spekuloos and cream cheese frosting and Reeses Cups filled with Spekuloos spread instead of peanut butter (which I usually make my mixing some Spekuloos crumbs with Spekuloos spread before piping some of the mix into homemade Chocolate shells). Just started perusing your blog but liking it a lot so far! these look amazing! is there any way of having the measurements converted to cups? sadly, i do not own a scale but i want to make these cookies!